If you’re a newer jumper–or you’re simply rusty from a winter spent on the ground–it’s easy to get overstimulated by the idea of going for another jump. Too many skydivers break it off with the sport entirely because of the stress posed by recurrency after a long wait: the threat of injury, grass-stained humiliation or both becomes too much. It doesn’t matter whether you’re a freshly-stamped A-license holder or a grizzled vet, safety- or performance-minded. 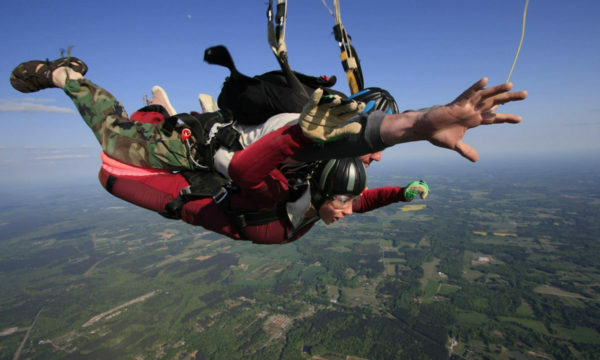 Coaching is the very best way to bridge the recurrency gap in skydiving, and our Skydive Monroe coaches are here to help! Unconvinced? Here’s how skydiving coaching can help you get current again and become a better skydiver. It’ll keep you from rushing. Lots of skydivers–new skydivers, especially–can be determined to pack too many things into one jump. When they don’t nail the first part of the plan, they’re confused as to whether to go back and work on the first part or move on to the next part anyway. This loses a lot of time and results in a lot of frustration. A coach can help you to pick one thing, tweak it to perfection and signal when to move on. It’ll help you calm down. Working with a skydiving coach will limit the variables you’re wrangling on the jump–and therefore give you the room and permission to breathe. A coach, much moreso than a jumping buddy, will help you to get into a focused zone before each jump. That can make the difference between a skydive that feels rushed and out-of-control and one in which a lot of learning and growth takes place. Even very experienced skydivers often feel nervous before trying something new. A skilled coach will help to prepare on the ground, will provide a point of focus in the plane, will keep a close eye on you in the air and will point out both the positive and negative aspects of the jump clearly and proactively in the debrief. Focus, positive reinforcement and incisive constructive criticism will serve any improving jumper’s sense of zen. It’ll help you manage your expectations. When a new skydiver is in the sky with some friends and s/he’s trying something new, they often feel (totally natural) disappointment if they can’t do it in the same way and with the same grace that they see others doing it. A skilled coach, as well as helping to tweak your body position, can help you focus on your own progression as opposed to the progression of the group with which you’re flying. On a coach jump, baby steps will add up surprisingly quickly. It’ll help you believe in yourself. Lack of belief in your own potential can manifest itself in many ways: fear, nervousness, indifference–believe it or not, even laziness. Working with a coach will inspire a new skydiver (or an old hand) with the belief that s/he has the control and ability to consciously improve because committing to skydiving coaching means committing to change. Once a student believes in the idea that they can change in a positive direction–believes that everything, from their physical reactions to their fears, can be modified and updated–anything becomes possible for that student to learn.